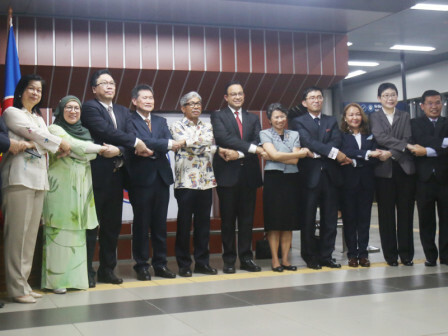 Jakarta Governor, Anies Baswedan together with ASEAN General Secretary, Dato Lim Jock Hoi and Foreign Affairs Deputy Minister of Republic Indonesia, Abdurrahman Mochammad Fachir inaugurated ASEAN (Association of South East Asian Nations) Station of MRT Jakarta, Wednesday (4/10). Regarding station name inauguration, Anies signed on a stone inscription located on the peron.
" I hope this name can strengthen our commitment to develop to be Jakarta better"
Anies considered, ASEAN is chosen to be MRT station name to announce that Jakarta is also ASEAN capital where many strategic meetings between ASEAN countries is held. "I hope this name can strengthen our commitment to develop Jakarta to be better," he added. Foreign Affairs Deputy Minister of Republic Indonesia, Abdurrahman Mochammad Fachir appreciates the name of this new MRT station. "I hope it can increase number of Southeast Asian country delegations' agenda meetings held in Jakarta," he mentioned. Meanwhile, Dato Lim Jock, ASEAN General Secretary hopes to increase meetings in all Southeast Jakarta countries each years thus his side can fully use ASEAN infrastructures in Jakarta, including this station.